Just thought I would share this with you as, with certain technical difficulties (a few gremlins today I think) is has taken me 3 times as long to write and collate as I wanted. 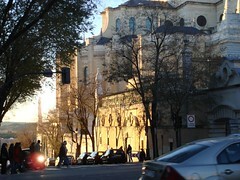 Last November I attended the European Council of International Schools (ECIS) annual conference in Madrid. Although I saw very little of Madrid (I spent a week there 8 years ago however), I did have a wonderful time presenting and learning from others at one of the top annual European events in education. Here is the official report I compiled for our PD Coordinator at Qatar Academy. As a presenter I initially joined the ECIS ICT team and co-presented the Web 2.0 Cocktail. This was very well attended to the extent that the room allocated was not large enough for us to go ahead with 'hands on' activities. Therefore we spent the 1.5 hours introducing and discussing different ways to use Web 2.0 as an educator to enhance the professional learning network, and as useful classroom integration tools. I focussed on Wikis (a similar but shorter presentation to the one given at ASD NESA) and on a relatively new 'micro-blogging' tool called Twitter. Due to the limited wireless bandwidth in the conference room all presenters had trouble going live to the Internet and we relied on cached pages and slideshows. My second presentation, Flatten Your Classroom and Embrace 21st Century Global Learning, was as a solo presenter. Based on on the development and experiences with the Flat Classroom Project this presentation highlighted the concepts, the implementations, the pedagogies and student work of both the 2006 and 2007 Flat Classroom Projects and of the 2007 Horizon Project. The slideshow of the presentation in it's online format is embedded below. As a live presentation however, given the Internet connectivity constraints at the conference, was completely cached and hypelinked via the PPT slideshow. During the presentation I discussed concepts, implementations, pedagogy and outcomes of both the 2006 and 2007 Flat Classsroom Projects and the sister 2007 Horizon Prioject. After the presentation I had a number of attendees ask what my own school thought about the project and the successful contributions the students made from QA. I realised then that I had been working in relative isolation and that very few colleagues knew what this project was about or what impact it was having on the students. As a general suggestion I believe it is immensely important to be given opportunities within your own school to share best practice pedagogy, particularly when an organisation such as ECIS recognise the importance of the project and offer a presentation opportunity (these are not given away freely by ECIS). We need to develop a culture of sharing and celebrating success within our own school so that we are able to confidently affirm to others that initiatives are supported and developed as a team. The NESA model is excellent in terms of sharing ideas and being able to braoden horizons however as an individual school we could be doing more internally to foster this. For more information go to research on the IB website and download the executive report on survey done on school-based/practioner research. It is through research that we can identify and integrate best-practice 21st century pedagogical models for learning. We need to encourage teachers at QA to be part of the research that is so desperately needed to affirm the impact of online learning, mobile learnign and others. Once again it is a matter of encouraging sharing and collegiality and supporting teachers in their everyday trials and succeses in the classroom. As part of the NAIS (National Association of Independent Schools in the USA) 20/20 Program, student-teacher teams from within and outside the USA work together each Fall semester to come up with solutions to one of 20 global problems. Every student at QA should have a global project experience at least once during their Primary and once during their secondary schooling. I was very impressed with the organisation, aims and objectives of the 20/20 Challenge and would be willing to work with other teachers to see QA involved. They were also starting to experiment with Web 2.0 tools and used a Ning (same as Flat Classroom Project) for communication. I attended two of your presentations in Madrid - the Web 2.0 cocktail and the Flat Classroom project - and was interested in reading your own reflection on the issues; however, when I clicked on the link I was asked for a password. My own wikispaces account didn't work - is there a guest access? I thought our Qatar Academy wiki, well at least the page I put my report on, was open to the public. However, this will not do, so thanks for alerting me to this fact. I do not like offering something to readers and then finding they cannot access it. Just for you, and everyone who stumbles onto this post, I have copied and pasted the short report here. Many thanks, Julie. I am hoping to use your thoughts, along with other valuable resources I found at ECIS and elsewhere, to start creating momentum at my school to promote interactive initiatives. Thanks again for all your postings- great blog!